If you have an Arduino Uno R3, then you don’t need any programmer to flash a bootloader into ATMEGA328P. How does it work: There are two microcontrollers on the Arduino board: ATMEGA328P (328P) and ATMEGA16U2 (16U2). 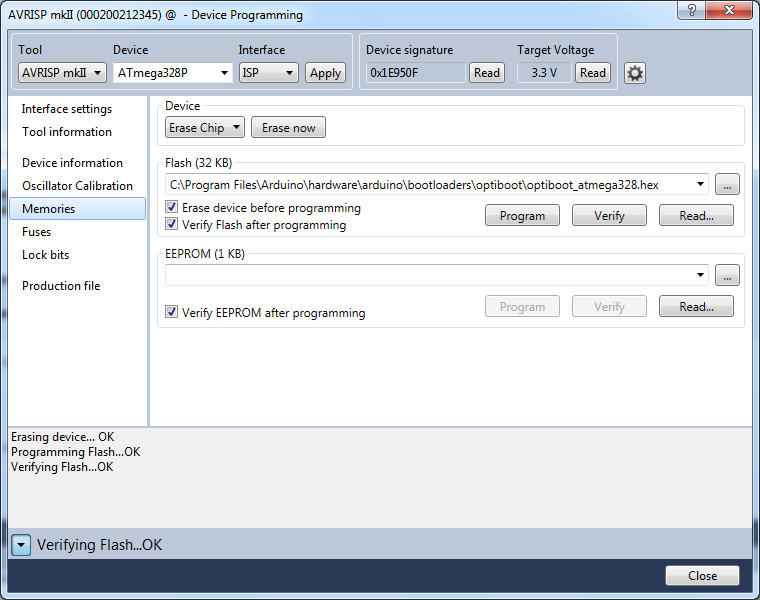 You can update firmware of 16U2 to become AVRISP MKII programmer and then use Atmel Studio to flash 328P. I started with kosakalab website, but I had some issues and the steps didn’t work very well for me (especially the part of flashing bootloader through Arduino Software). There were more problems and therefore I decided to put the whole process on my blog, so other people can save their time. You will need Atmel FLIP software to update the firmware inside 16U2. 1. Go to http://www.atmel.com/tools/FLIP.aspx and download FLIP. 2. Install it. You should not have any problems, just follow the installation wizard. 3. Take your Arduino board, disconnect it from Power and USB. Fit a Link on ICSP1 header, pins 5-6 (this will keep 16U2 RESET in Low). 4. Connect Arduino to USB. 5. Unfit the Link ICSP1 (5-6). At this moment, 16U2 goes into DFU mode. A new USB device should be recognized. We are ready to re-flash the firmware inside 16U2. 1. Download AVRISP MKII hex file here. If you would like to know how to compile it, have a look at Compile LUFA AVRISP MKII Project. The file is based on LUFA project. 2. Disconnect your Arduino from USB cable and Power. 3. Fit a Link on ICSP1 pins 5-6. 5. Unfit the Link on ICSP1 pins 5-6. 6. Start FLIP Software: Go to Start -> All Programs -> Flip -> Flip. 7. Go to Settings -> Communication -> USB. 12. 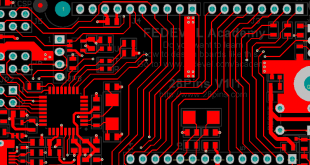 ATMEGA16U2 is now AVRISP MKII and it runs in Atmel Studio Mode. 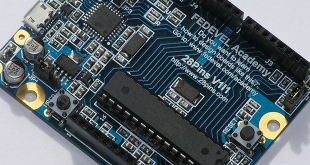 Important: Your “Arduino AVRISP MKII” can run in two modes: Atmel Studio or Avrdude. Below I only will be speaking about Atmel Studio mode as I had a lot of problems with Avrdude mode. 2. After the installation, connect your Arduino to the USB cable. Both LEDs (RX&TX) should blink two times (that means, 16U2 is in “Atmel Studio” mode,). A new device will be recognized. 5. You are ready to flash ATMEGA328P. Go to the next point. 3. Start Atmel Studio. Go to Start -> All Programs -> Atmel -> Atmel Studio. 5. Select: “Tool” -> AVRISP mkII; “Device” -> ATmega328P; “Interface” -> ISP; and press “Apply” button. 6. 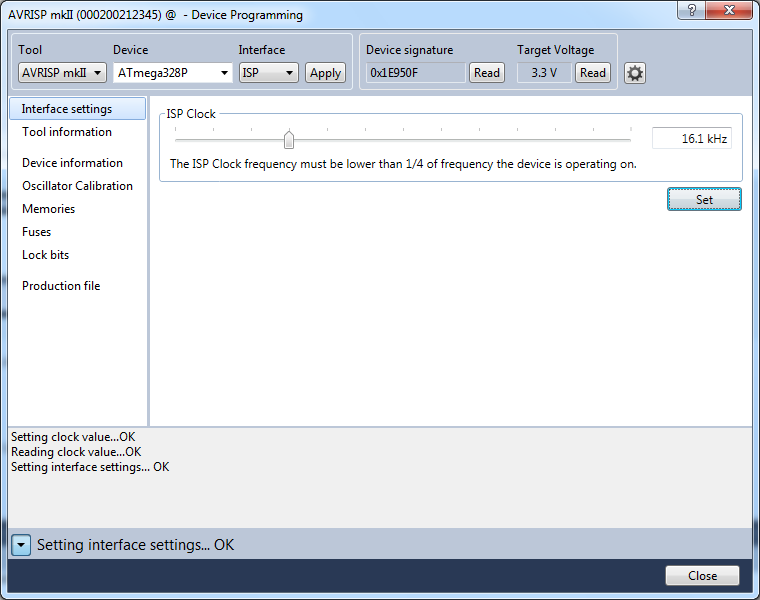 Set ISP clock to 16.1kHHz. Press “Set” button. Note: Programming will not work if you set a very low ISP clock speed. You will get error: “ispProgramMem: Error status received: Got 0x81, expected 0x00 (RDY/nBSY pin sampling timed out)”. However, the maximum ISP speed is also limited and it can not be more than 1/4 frequency of the device. 10. You have successfully programmed 328P with Arduino bootloader. In the next step, we will put back the original 16U2 firmware. Almost done. We need to put back the original software into the ATMEGA16U2. 1. Disconnect your Arduino from Power and USB. 2. Put a Link on the ICSP1 and short pins 5-6. 4. Remove the ICSP1 5-6 Link. 5. Start FLIP software. Go to: Start -> All Programs -> Flip -> Flip. 6. Go to: Settings -> Communication -> USB. 10. Disconnect USB cable and connect it again. A new USB device should be recognized. 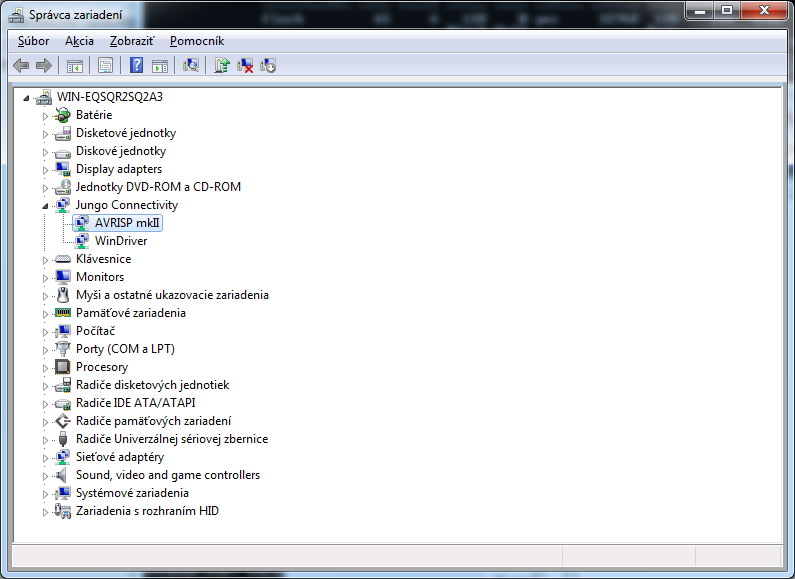 If driver is not installed automatically, you will find it in “c:\Program Files\Arduino\drivers\”. 12. Great! We can now test a Blink example. Start Arduino software (Start -> Arduino). 13. Click on the “Open” icon (arrow Up) -> 01.Basics -> Blink. 14. 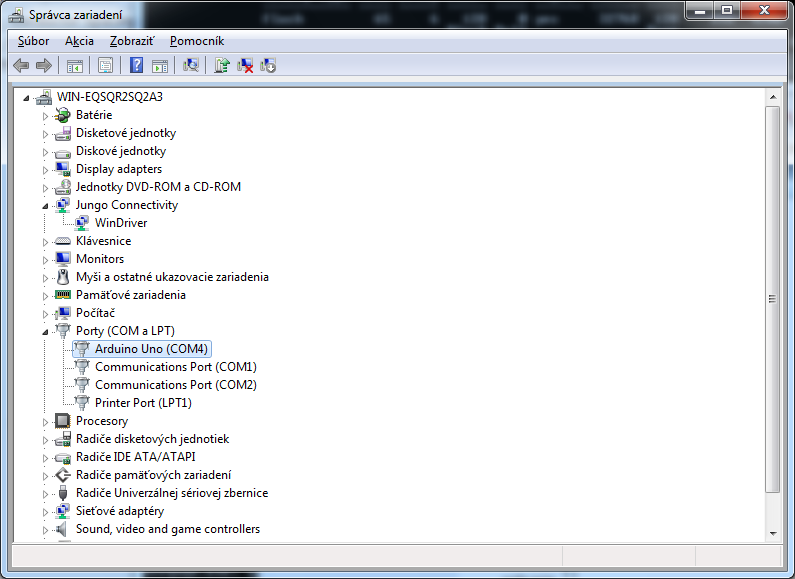 Select COM Port: Tools -> Serial Port -> COM(select the port where the board was recognized). 15. Click to “Upload” icon (arrow Right). 17. Done! You have successfully re-programmed ATMEGA328P without using any external Programmer. After this course, you will design your own Arduino like board. This course is for everyone who has never designed any board before and would like to try it. Thanks a lot, it worked just fine. Thought I had to buy a new ATMega. Perfect I am very happy that this post helped you. Thank you for leaving your comment. Thank you Ovidiu. I am very glad you found it useful. 3 pololu drivers a4988 red as well .. I am very pleased with the results and now i can pass through the next level of doing things: my prusa i3 mendel einstein. Didn’t work for me. I wonder if it’s because I had to use Atmel Studio 7 and force Windows to use a unsigned driver. When I try to setup the AVR in Atmel Studio it will disconnect and ends up with a error. It should work even with unsigned driver. The only issue is, you need to be very careful about using the correct driver for the correct Arduino mode and for the correct software (Atmel Studio or Arduino environment). Only one combination will work. 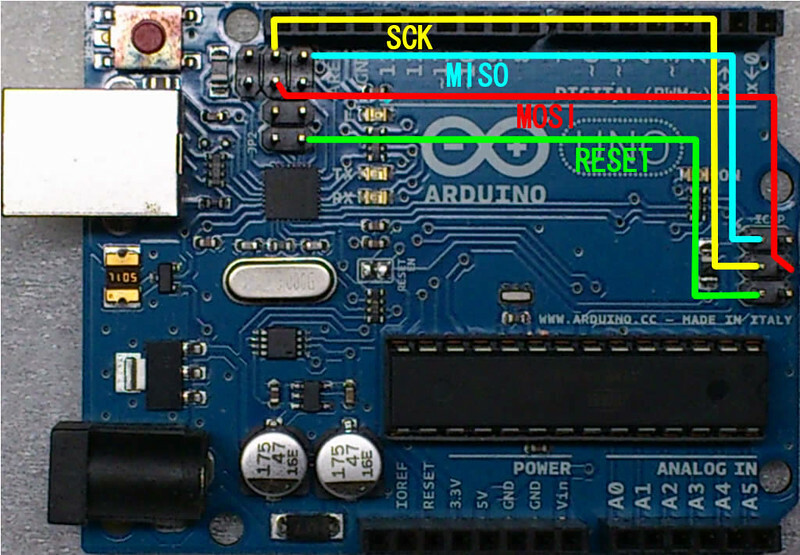 How can you put in DFU mode an Arduino Mega 2650 R3 ?? Thank you ! Hello, I am not really sure. I din’t try that board, but if the Microcontroller supports DFU, you should be able to find in datasheet which pin has to be controlled. after pressing apply i got error “Unable to connect to tool AVRISP mkII (000200212345)” please help ! It should work. Maybe wrong driver? Or something with cable / board? Try also switch off / on AVR studio. Nice article, really helpful !! What do you think it could be ? As I said, everything seems fine, I can see the device in the device manager, as Jungo Connectivity -> AVRISP mk II, the two LED’s are blinking twice when I plug the board into USB and I checked my wires almost 10 time, always the same issue, can’t connect ! I also tried the other way, by the arduino software, after flashing the correct hex file, and idem. I tried with another computer without solving the problem. 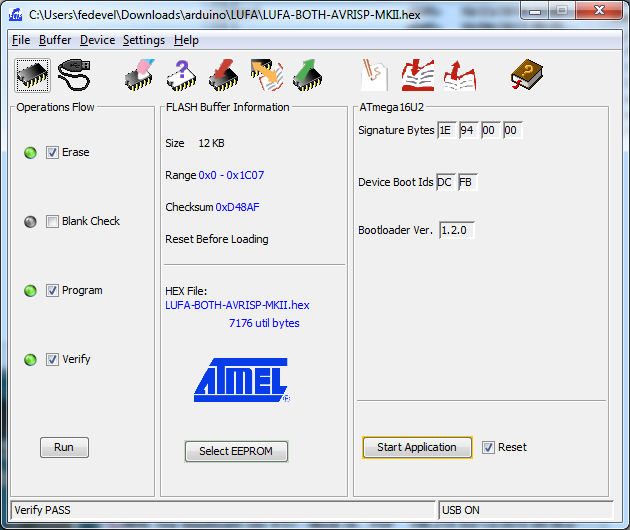 But, i noticed when I turn my board in DFU mode with Atmel Studio, I can see it in Device Programming in the tool list as “Atmel Mega DFU”, I choose the right device and press “Apply”, I can see these informations in “Tool information” tab. Unable to enter programming mode. The read device ID does not match the selected device or any other supported devices. Unexpected signature 0x00940000 (expected 0x001e9489). Does the problem could come from there ? Don’t worry. Even I spent couple of days going through something similar. That is exactly the reason why I created this page, so other people don’t have to. I am just not sure why your board doesn’t work. Be sure you have the eFUSES set correctly, comunication speed is set right, you use the right drivers, AVR/Arduino mode is selected correctly and double check the wiring. Then it should work. Anyway, thank you for your advices, and even if I didn’t solve the problem, I learned a lot, so thanks again and have a nice day. Hi! I have just bought an arduino uno r3 from an online store. This is my first arduino board(rather my first microcontroller). First of all, whenever I plug the board into my Windows 8 32 bit pc, it says “USB Device not recognised.” In the device manager, it is showing it as “Unknown Device.” According to the Arduino instructions, I tried to install the arduino drivers that came with the IDE. But it says “Windows has stopped this device as it has reported problems(Code 43).The device is not registering itself as a COM Port device. Hence, it is not being detected by IDE. Tried hundreds of things, but got no success. Then, I came across this post. After installing flip, whenever I try to install the driver manually(it is not installing automatically) , it displays the same message(Code 43). The device is not being recognised by FLIP and hence I cannot load the hex. I am now in serious trouble as I have to us it for a school project within a week. Please help me. Did you try to use a different USB cable? Hi, I have problem in Atmel Studio 7, when I click on “Read”. I get error that firmware on the tool is not updated. How I can fix that? Try to use the old Atmel Studio. I had some problems with drivers when using latest software. I came here following the link you give me. I couldn’t find the first step of programming 28PIN here. In the first step I need to erase the chip (16U2) and set Fuse and Program it. I don’t have experience of Programming Micro controllers. 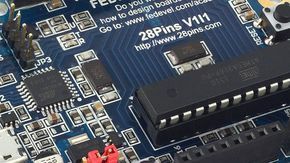 Still i did’t know how to use Arduino to do the above steps for 28PIN. You are right. 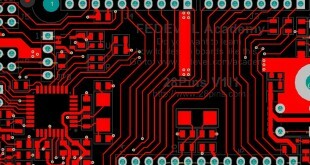 I am not 100% sure, but you should be able to wire up 16U2 ICSP same way as you wire up 328P to another arduino board. Let me know then.